In a world where today's fashion was yesterday's gossip, do you ever find yourself asking the question where to do I fit in? Am I enough? Is it okay just to me? Of course the answer is always , "yes." But in a world where we are bombarded with media, images and being told we aren't good enough, we often wonder if we should stand apart. If you've ever struggled to be who you are, you've found the right book. "How to be a Hepburn in a Kardashian World" by Jordan Christy is about having respect where often women throw it away like yesterday's fashion. This isn't one of those books about women standing up for themselves and they saying they are better than men, this about women understanding that they are precious, they should not throw themselves away on the culture of today's society because that is the image the world is throwing our way. Jordan gives advice on how to have grace in modest attire, social media etiquette, how to work hard, being modest in beauty and having wonderful friendships. This book is tasteful like a big sister talking to her younger sisters in a graceful way and is perfect for anyone entering the workforce. It would be a great gift for a teenager or a woman of any age looking to having a little more style and class in their life. Not all patterns are in ladies and not all friends are in either, so choose wisely! This book was great and I will refer to it from time to time. I really enjoyed this book. I give this book 5/5 stars and a favorable review was not required. Thank you to Center Street for providing me a complimentary copy. 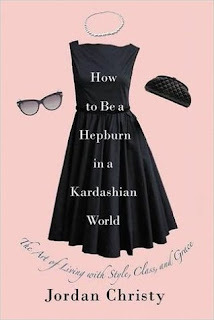 "How to Be a Hepburn in a Kardashian World" releases on April 4, 2017. To pre-order your copy, head here! This sounds like a fun read. Good review.